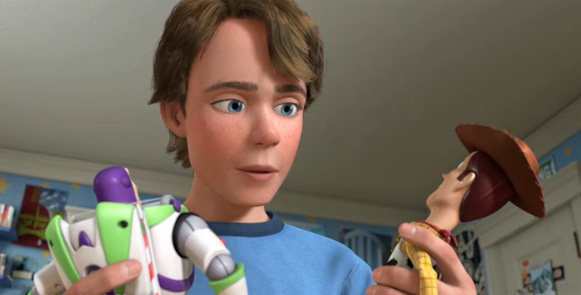 It’s been 11 years since Woody, Buzz, and the gang were last on the big screen, and in that time, it’s not just Andy (their owner) who has grown up. 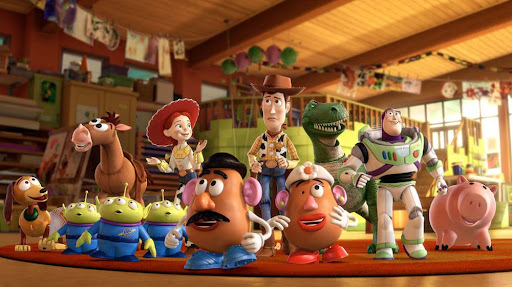 The passage of time is what gives Toy Story 3 so much of its emotional heft. No matter how old you are, and whether you see it with or without a child sitting next to you, it’s hard to deny that this third film hits you in all the right places. It’s surely worth the wait. In TS3, Andy is now 17 and days away from leaving for college. Woody assures the gang that even though they’ve been neglected for a while, when Andy leaves, they’ll all be together, in the attic, not donated to a mysterious “day care” center or relegated to the trash. Well, he’s wrong, and after a couple of twists, they all end up at Sunnyside Day Care, a bright, colorful paradise filled with lots of other toys — and more importantly, lots and lots of kids who can’t wait to play with them and who will never outgrow them, like Andy has. To tell any more of the plot would be to spoil it. 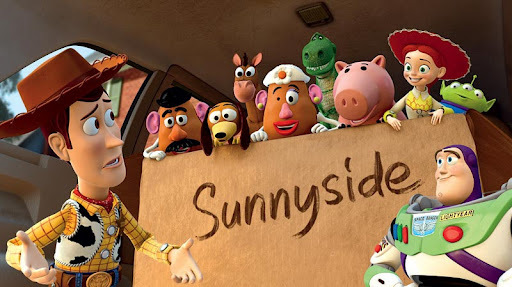 But suffice it to say, Sunnyside is not what it seems, and the toys soon realize how good they had it when they were with Andy. Told with just the right mix of humor, sentiment, and creative visual flair, TS3 is a real treat. Kids who did not grow up with these characters will surely find much to enjoy, but undoubtedly, it’s the adult members of the audience who will likely get the most out of the film. TS3 begins with a 5-minute Wild West fantasy sequence that reintroduces the characters in amusing fashion. How fun to see them all again, you think, and then Randy Newman’s “You’ve Got a Friend in Me” starts playing over the soundtrack and soon you’re back in 1995, when we were first introduced to these characters, and you’re filled with such warmth. How genius are the folks at Pixar that these characters — these animated, computer-generated characters — are able to engender such fondness even after all this time? Of course, that’s just the beginning, both literally and figuratively. The quality of the animation since 1995 has come a long way, and even if the 3D doesn’t add excitement and thrill like it does in some other animated films, it’s subtle and adds great depth to this picture (no one is doing 3D animation these days as well as Pixar is). I’ll admit, I didn’t think the screenplay was as strong as those for the other two TS films, but it almost doesn’t matter because the big-picture themes (we all grow up and need to let go of our childhood eventually, but friendship is everlasting) are so powerful and so richly portrayed. In addition, the characters are still as endearing as ever, that when the toys are in real danger (yes, it’s true — and it’s also not very kid-friendly), you actually fear they may not make it to the final reel. I don’t care what you say — if your eyes aren’t watery at the end of Toy Story 3, then you’re not in the right theater. No one could make a third film in a series like Pixar has. 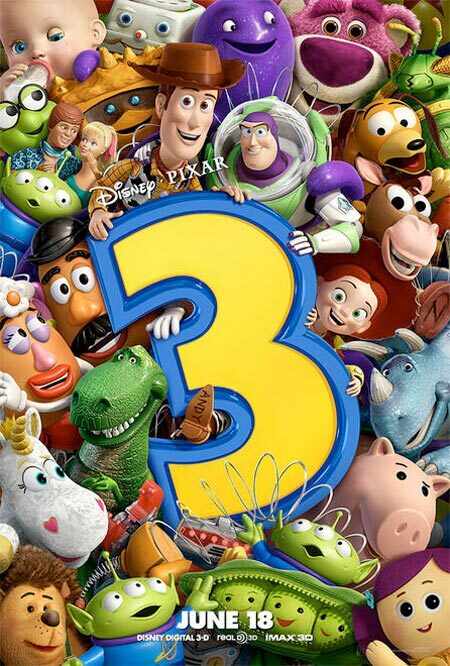 It doesn’t take a new owner for this franchise to have new life, but you get the sense at the end of Toy Story 3 that Woody, Buzz, et al could be back again before long. Let’s just hope they don’t wait another 11 years. I’m giving this film an A–. Here’s to My Future. But First, Here’s to My Yesterday! What Am I Going to Do This Summer? Who Could Be Scared of a Jeffrey?